Software took center stage today at the start of Apple's Worldwide Developer's Conference, an annual gathering bringing together developers and Apple aficionados looking to the next big thing. Big changes are coming to iOS 10, which will be available to download for iPhone and iPad users this fall. Perhaps the most notable change is coming to iMessages, which are being injected with more utility and creativity. The new iOS is so smart it can highlight "emojifiable" words giving users a heads up if they'd like to change the word "pizza" to a picture of a slice or find the perfect emoji face to express the word "love." Among the other options: add handwritten messages and special flare or even take over the entire screen with a note. Invisible ink also provides a dramatic reveal for surprise messages and photos. Apple is opening iMessages to developers, allowing them to create more experiences for the platform, such as sending money to a friend. The other radical change: Siri is also being opened up to developers. This will allow even more utility for the virtual assistant, allowing Siri to work within apps to help with a command, such as transcribing a message to a friend within an app. Siri will also bring more value to QuickType by suggesting more intelligent responses in messages based on what it knows you're doing, where you are, what's on your calendar or what you've been searching for. Apple is also bringing more organization to photos by using deep learning to recognize people, places and scenes in a photo collection, making searching for a memory that much easier. The process is done locally on a device and maintains a user's privacy, according to Apple. The new iOS can also transcribe all of those voicemails you never listen and will bring a more proactive approach to Maps. Also expect new options in Apple News and a cleaner user experience for Apple Music -- which was launched at last year's WWDC -- when iOS 10 comes this fall. (Andrew Burton/Getty Images) Apple Vice President of Technology, Kevin Lynch, introduces a new piece of iWatch software called "Scribble," at an Apple event at the Worldwide Developer's Conference, June 13, 2016, in San Francisco. Apple's third iteration of watchOS is so speedy it's "going to feel like a whole new watch," Kevin Lynch, Apple's vice president of technology, said during a demonstration today. The new operating system is seven times faster than its predecessor, Lynch added. Aside from the speed, users will be able to choose which apps go in their dock and choose the order and get a quick glance at pertinent information without having to open an app. 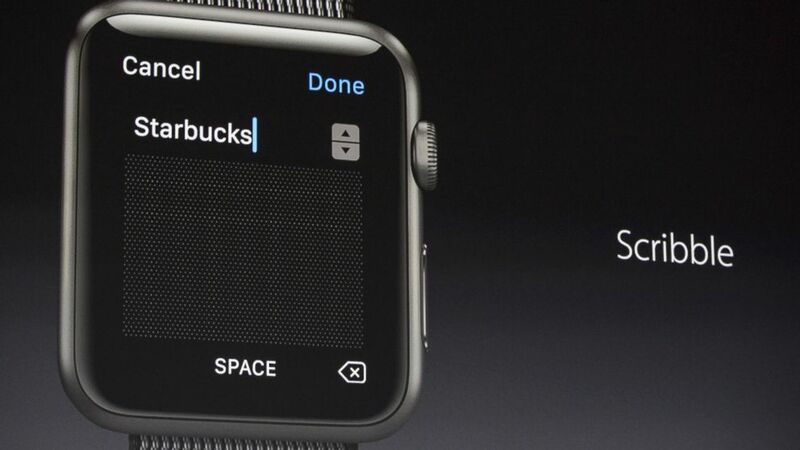 A new "scribble" feature will let users write quick replies with their finger, which will be changed into text. The feature works in English and Chinese. An "SOS" feature lets the person wearing the watch press and hold the side button on the watch to call 911 (or the equivalent emergency number in another country) via cellular or Wi-Fi. Using the feature will then notify a person's emergency contacts, along with a message of their location. It will also show the medical ID information the person has filled out, providing potentially life-saving information to first responders. The new watchOS will also track fitness for people in wheelchairs, taking into account the fact people push their wheelchairs differently. Instead of the periodic alerts to stand, users in wheelchairs will get alerts to roll around for a brief activity break. A preview is available to developers today and a free upgrade will be released this fall. Less than a year after Apple introduced tvOS, Eddy Cue, Apple's senior vice president of internet software and services, showed off some upgrades coming to the operating system. "We’ve said the future of TV is apps and the response to Apple TV has been incredible," Cue said. One of the biggest features: Apple is making a new version of the popular Siri-enabled remote for the iPhone, which will still operate via voice and touch navigation, while relying on the phone's accelerometer and gyroscope for game-playing. Siri-enabled search is also coming to YouTube and can help across the entire platform for queries by topic. For instance, say: "Find high school comedies from the '80s" and tvOS 2 will serve up a variety of selections. A single sign-in feature will also take the hassle out of signing into each of your subscription services. The developer preview will launch today, with tvOS 2 coming to customers this fall. 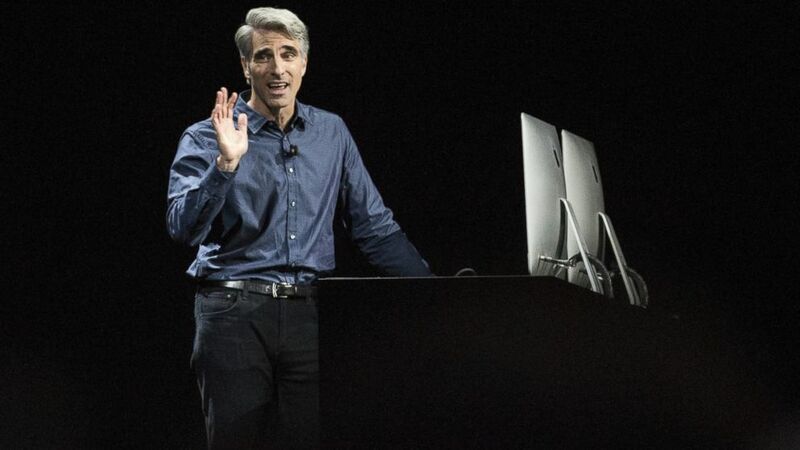 (Andrew Burton/Getty Images) Craig Federighi, Apple's senior vice president of Software Engineering, introduces the new macOS Sierra software at an Apple event at the Worldwide Developer's Conference, June 13, 2016 in San Francisco. OS X, the operating system for the Mac, will now be known as macOS, a name that Craig Federighi, Apple's senior vice president of software engineering, said was chosen to fit in with the other OS names in Apple's ecosystem. The installment coming this fall will be known as macOS Sierra. Many of the new features unveiled today are similar to those in Microsoft's Windows 10. Apple is bringing Siri to macOS Sierra, letting users easily ask the virtual assistant to find information or even pull up a specific file saved somewhere on the computer. Apple Watch users can step up to their Mac and quickly unlock their computer without having to enter a password. More continuity features help foster productivity across devices and let users easily see what's on their desktop. "Continuity is like magic, your devices are able to sense themselves around you," Federighi said. Apple Pay, the digital wallet available across many of Apple's newest devices is now coming to the web via macOS Sierra. Choose Apple Pay as a payment method at participating retailers and then authenticate the purchase using TouchID on the Apple Watch or a supported iPhone to complete the transaction. A preview is available to developers today and the public can sign up for a beta test version in July. The free upgrade will be rolled out this fall.